Explore the 11 most charming spots around the Akeno Sunflower Fields. 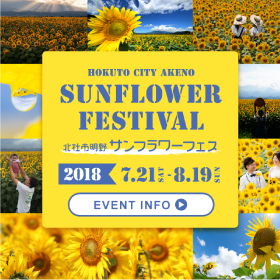 After enjoying colorful flowers in the Heidi’s Village next to the Akeno Sunflower fields, go north on the Kiyosato line (Route 141), which is approximately 30 minutes by car to the Kiyosato area. You can enjoy the wind of a refreshing plateau as the altitude goes up. Have a delicious lunch and coffee time while enjoying the magnificent view over Mt. Fuji and the Southern Alps mountains. A theme park, showing the world of the TV animation, “Heidi, Girl of the Alps”. You can find there so many beautiful seasonal flowers. Segway tour in the park is also very popular. You can find there three old wooden school buildings from the Meiji, Taisho, and Showa Era. Especially the Showa building as a “Oishii Gakko” is popular for its restaurant where you can eat ”Kyushoku" the Japanese school lunch. A Michi-no-Eki is a roadside rest area for those driving across Japan. There are direct sales with fresh vegetables, restaurants, dog run space and so on. Shingen soft cream with raw “Shingen mochi” is the one of the MUST! When you go up to the top with a cable car, a beautiful garden spreads. Brewpub Restaurant ROCK is the symbol of Kiyosato Highland Area and loved by locals as well. Its specialty the curry you have to try! Do not forget to enjoy the craft beer "Touchdown" brewed in there. When you go up to the mountaintop with the lift of the ski resort, there is the “Kiyosato Terrace” with the special seats of altitude 1,900 m. A spectacular view over the blue sky, Mt. Fuji and the Southern Alps mountains are waiting for you. In the Makiba park, you can interact with animals from the Yatsugatake Farm such as sheep and goat. The on-site restaurant offers local gourmet. The view of Mt. Fuji from here is awesome! From the Akeno Sunflower fields head towards Nagano via the Koshu Kaido (Route 20), you will get to the hometown of natural water, Hakushu. After having enjoyed playing in the Ojiragawa river, let’s touch the art or have a refreshment time on the hot spring in Kobuchizawa. There are also many charming spots where you can enjoy nature in the Yatsugatake Chuo highland! Located at the foot of Minami Alps, A complex complex including BBQ sites, restaurants, day-trip hot springs, etc. surrounded by the source flow of forest and natural water at the foot of the Southern Alps "Ogaki River". It is a cool spot popular among families if you can enjoy the river even for young children. An art museum where you can quietly appreciate the legendary street artist Keith Haring's art works in the beautiful nature of Yatsugatake. It is also highly recommended to have coffee time at the museum cafe surrounded by Keith's work! You can enjoy a high concentration natural mineral hot spring of 46 degree Celsius, which springs from the 1,500 m of the ground. Let's refresh in the open-air bath and sauna! The park located at Yatsugatake Chuo Highland at an altitude of 1300 m. There is a strider park and a planetarium in the park. At the deli & cafe which opened this June you can enjoy delicious lunch or coffee. 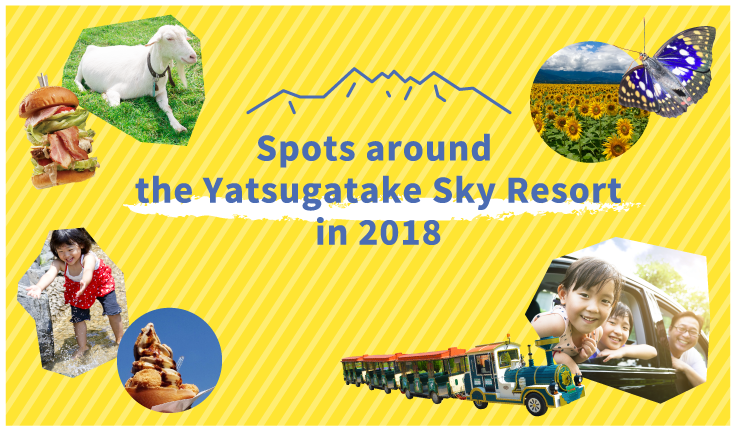 A sky resort where you can fully enjoy the view of the Yatsugatake Highland. Especially in the summer, there are lots of viewpoints, such as "Hananosato" with many beautiful flowers! With a sightseeing cart you can easily go to the scenic spots at an altitude of 1,420 m.
Copyright TENKU HAKURANKAI. All Rights Reserved.